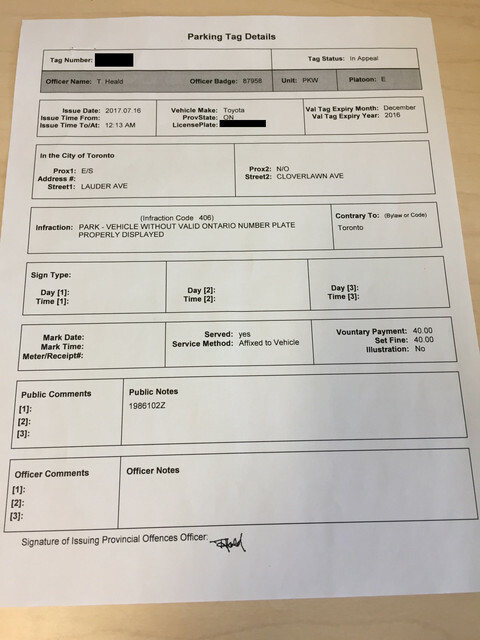 In July, my girlfriend had received 2 tickets for parking on a Toronto street. One ticket was for parking after midnight without a permit. She had gone into the home she was visiting to look online to buy a permit but was ticketed before this could be achieved. The other was for not having a valid plate because she had one of the defective plates where the upper "sticker" with the colour falls off. She DID purchase her valid and current registration sticker but did not want to place it on the damaged plate in the event the sticker would fall off with the top of the plate and while she was in the process of getting a new plate. After requesting a trial, we requested disclosure twice and received nothing. We filed a constitutional question based on a lack of disclosure. She appeared (March 1st) for her trial and explained to the justice that she had requested disclosure twice and has still not received any. She explained to the justice that she is a student who had to travel from out of town to appear for the trial and would have been prepared for trial had the prosecution provided the disclosure that was requested. She added that it is an undue hardship to have to return for another court date. The prosecutor made the claim that they could not send disclosure because no phone number was given. This, I assume, goes along with the policy that they do not send any documents out but make you drive from out of town to pick them up yourself? They did have her address in her file, where they sent all other documents and the fax number from where the requests originated from. The justice ruled that they will move the trial to March 21st. The prosecution provided her with the following documents (see attached) which provides very little detail. The notes provided are 4 characters on a page with the verbal explanation "4R and 4F means right and forward". Whatever this means? This is far from helpful for trying to defend herself. Is this adequate disclosure? Can/should we request more detailed notes, the certificate of infraction or any other detail? Must we provide a phone number or can we give an address? If so, is there time to do this before the next court date? If this is not adequate? Do we file another constitutional question immediately for lack of proper disclosure? What is the best way to proceed, if any? How much more are you expecting out of a disclosure request for parking tickets? Our initial hope was that the time to trial would be unreasonable or to not receive disclosure so that the charges would be stayed. Unfortunately, this did not happen. The "notes" provided are essentially worthless and provides her no details as to what the officer will say in a trial. So, can we assume that this officer is just going to repeat the information from the ticket with no other details? 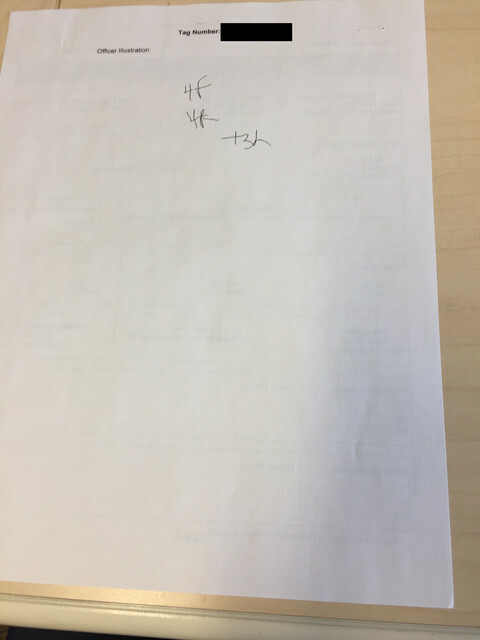 Will these 4F and 4R be somehow relevant but we do not understand how so? 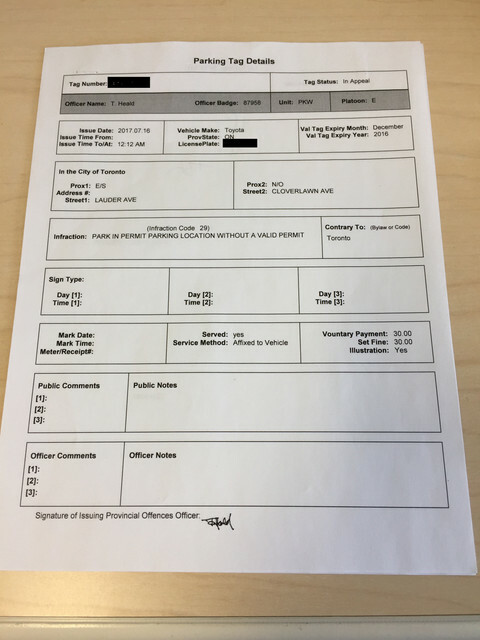 According to Ticket Combat (for what the information is worth), it outlined the prosecution's requirement of providing a "Certificate of Parking Infraction" in accordance with Part II of the Provincial Offences Act. Is this accurate? If so, would this be reason for a stay based on lack of disclosure? Disclosure requests typically aren't mailed out anymore. 10 years ago maybe. They are to be made available to you, but they don't have to leave it on your doorstep. Are phone numbers required on a request? There's no rule saying it is. However, simply leaving an address is lacking. They will probably want to let you know your package is ready. Making them write up a letter through snail mail is making them jump through hoops that they don't need to jump through. You're supposed to want your disclosure. There is no point in playing catching me if you can. You're only wasting your own time because a case is simply going to be adjourned. If you don't have a number, leave an email address. They might even be able to send a PDF of the paperwork so you don't have to leave your house. As for the Certificate of Offense, are you referring to the second page of the carbon copy papers? Hand writing parking tickets is old school. It's mostly electronic. If you're looking for a page saying "I served this ticket by affixing it to the vehicle" with a signature, you already have that information. It's in your disclosure package (Service Method: affixed to vehicle). Thank you for the advice and help. Much appreciated. These are hard tickets to fight. She did park without a permit and didn't have the sticker. Your best bet might be to see if the court will let you plead to one and have the other dropped. My girlfriend went to court today (for the second time) with the plan to provide proof that she did have a valid sticker a the time of the ticket and would want that charge dropped, if she plead guilty to the other charge. She arrived at the court and found on the docket her case info crossed off and said "ADJ". She was confused by what to do, if they are going to make her come back for a third time? She met with the prosecutor at check in and was asked if she has any evidence against the charges. She pulled out the proof that she had a valid sticker (for the one charge), the prosecutor did not even look at the paper and asked her to sit down. She was called up, and all charges were dropped. My girlfriend noted that the enforcement officer who gave her the ticket was not among the officers who were called up and identified, which was likely the cause for tossing the cases. Thank you all for your continued support in helping people navigate the sometimes complex system.